This blog often features collaborative efforts from some of the extreme metal underground's most daring musicians, yet has primarily reviewed beers that are made by only one brewery. Today I'm changing that. 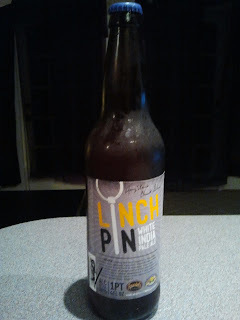 This white IPA (the first I've ever had) is the result of two breweries I've never explored combining their efforts to make a bold and delicious beer. Green Flash are a young brewery from San Diego whom I've heard much about but haven't yet sampled. Founders are a brewery I'd never heard of before buying this beer, and it sadly appears that I'm not able to purchase any of their beers in the state of Florida. Drat. On to the beer itself, we've got a beautiful golden pour with an incredibly strong, foamy head that never fully fades away. 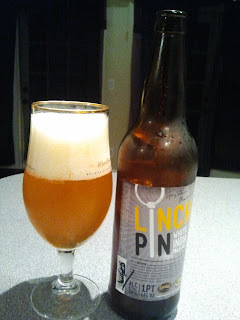 The scent is heavy with fragrant pine and the sweetness of citrus, but the taste is primarily the piney tastes of hops that is the trademark of IPAs. This beer drinks more smoothly than the standard IPA, which is often hoppy and bitter to the point where many new drinkers are put off. This would be a great introduction to the high potential of the IPA format. This is smooth and tangy without being hoppy enough to warrant a grimace. As I get deeper into the beer, I'm finding a strong orange flavor is coming out and it's perfect. As with many beers, half the depth of the flavor is hitting me as I exhale after each sip, which really provides interesting surprises with this solid beer. Much like the diverse pairing of breweries, the beer seems to open up with slightly different flavors with each sip. It's a really beautiful beer and I'm glad to have had the opportunity to give it a shot. It was recently suggested by an acquaintance that I begin suggesting music and beer pairings for each review. While I'll primarily do this for albums rather than beers, I'm going to begin this tradition by pairing this beer with the equally complex split from Sadness Saturn and Golden Raven, with its harsh and beautiful moments complementing a beer both bitter and smooth.